You cannot imagine how good it feels to be back home on the farm in Glenburn, Victoria. This time of the year Two Hills Vineyard is at its best. The sky is blue, the sun is warm and the vineyard is “in full steam”. And puffing along, I am enjoying rural life wholeheartedly. Rest assured I will taste some wonderful wines, have fun with my family and catch up with friends. There will be many memorable barbecues and lunches on the “lawn” on the farm. We will drink delicious wines and I will come back in 2009 well rested with a tank full of new energy. The Man from Mosel River is also taking a break from blogging. I might go down to the “Innocent Bystander” in Healesville which has a wireless service and I might enter a post here and there but do not expect much. I had only about 24 hours for a family visit in Trier, my beloved home town. This is not much time and I needed to buy urgently some supplies. I was in a hurry which is not good when you end up in a Christmas market. Gee it was crowded. I had not expected so many people. After all the media lamented the economic crisis, the downturn, the loss of jobs and income in short a dark and insecure future. Nothing of that could be felt at the Christmas market in Trier. It was packed with people. I was pushed through the masses. One could hear many languages, French, English, Dutch, Luxembourgian and various German dialects. We have learned from other economic crises that people try to forget the dire circumstances by celebrating even more and more intensely than in “normal’ times. Well, that must have been the case in Trier as well. Everywhere people were drinking mulled wine which is good against the cold but also beer and “normal” wines were on offer. It was a cheerful mood; joyous and happy faces wherever I looked. The pictures above and below give you an idea. St. Peter must have been happy too with all these many cheerful Christmas shoppers. After a bath in the crowd I sought refuge in a quiet place and escaped to one of my favourite watering wholes, the wine bar Kesselstatt. I ordered a ‘2007 Kaseler Nies’chen Riesling’ from the Ruwer river, a tributary of the Mosel and listened to the conversations of my neighbours. It’s good to be home and Christmas is an auspicious time. I let myself be taken in and my mind flowed through the narrow lanes and back streets of the old Roman town. I could smell the smells of my youth and saw faces of people long gone. I dreamt myself away for a while before strolling home. It’s s pity that 24 hours have only 1440 minutes. 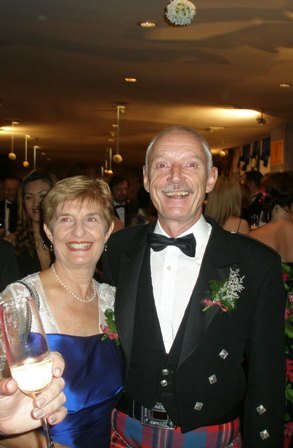 Our first social function here in Bangkok was the attendance of the St. Andrews ball in the Amari Watergate Hotel on Saturday 22th November. Wherever we live in Asia, we join the Scottish St. Andrews and the Irish St. Patrick’s Society. 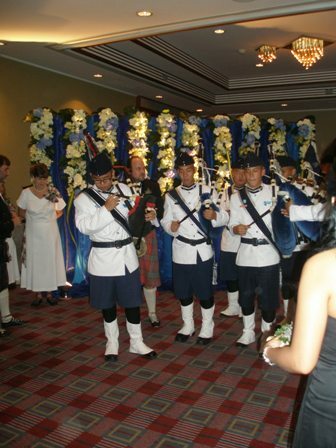 The Bangkok St. Andrews Society was established in 1890 by a small group of expatriate Scots to celebrate among others Scottish culture. A special reunion awaited us in Bangkok, a reunion we were ardently looking forward to. 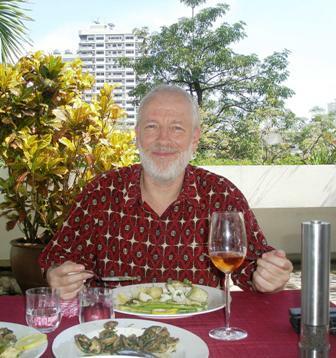 Our good old friend Rab Thomas whom we met many years ago in Jakarta has settled down in Thailand. It was a tremendous pleasure to meet him again. The ball was the right occasion for this reunion. It was a lovely evening. About 280 people sat around large tables with delicious food. Entertained by pipe bands, dance performances and so on, we made new friends. At our table there were quite a few Thailand veterans. To listen to their stories was very informative and entertaining, especially for newcomers to Bangkok like us. 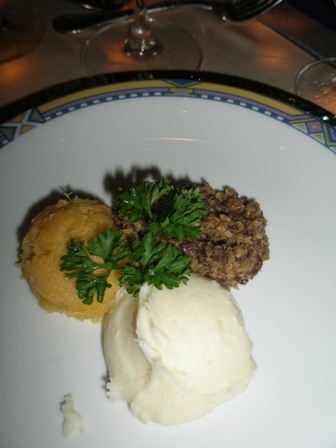 Have you ever heard about Scottish cheeses? Do the names ‘Loch Arthur’, ‘Howgate’, ‘Dunlope’ or ‘Strathkinnes’ ring a bell? Well, then you should rush to get to know them; there is not only whisky in Scotland (by the way “Famous Grouse” was served in lavish quantities). Scottish cheeses are the world’s best kept secret, I would say. Each of them was wonderful and deserved a special mention. Loch Arthur: traditional farmhouse organic cheddar from Loch Arthur near Dumfries. Howgate: Established artisan farmhouse cheesemaker, originally from Howgate near Edinburgh, now in Dundee, pioneered the making in Scotland of continental cheeses including Howgate Brie, Camembert and Pentland. 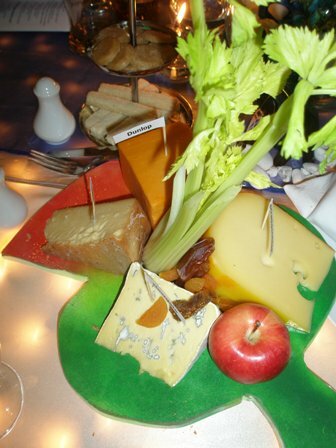 Other cheeses include St Andrews, Bishop Kennedy, Strathkinness and Howgate Highland Cream Cheese. Dunlop: resembles Scottish cheddar with soft texture. Mostly creamery-made in blocks on Arran and Islay but also traditionally in Ayrshire (Burns), near Dumfries and at Perth (Gowrie). Strathkinness: award winning Scottish version of Gruyere, nearly 50 gallons of milk goes into a cheese! Matured 6-12 months. Limited availability. These four cheeses are only a select few; there are many more to explore. Please visit the above webpage for more information including sources where you can oder them. PS 1: Needless to say that the evening ended in wonderful harmony. We went home utterly satisfied. We will definetely come back next year. PS 2: Wines were also served of course but it was a mass produced wine not worth mentioning. Recently friends in Beijing invited me to a fancy place for dinner. Da Zhai Men – 大宅门, or as it is called in English “Grand Mansion Business Club” (Chinese style) or 大宅门中式餐饮会所, that’s what the brochure says. 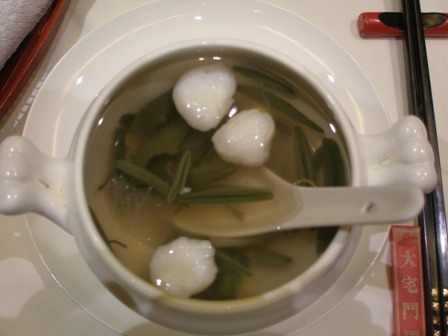 The place is a kind of replica of a Ming and/or Ching dynasty style eating place. The decoration is amazing. Though housed in a modern, glass walled, high rise building, the internal architecture makes you feel having entered a distant, forgotten but very exotic world, a world you otherwise see only in historical epic movies or kung fu films. The entrance is styled as a gate to a compound, a kind of “se he yuan”, or four wing traditional house. I felt like “abducted” into a forgotten world. The restaurant staff is clad in outfits which might also come from the good old times of imperial China, very colourful costumes. I cannot judge their authenticity but I liked the combination of fur, colour, patterns and ornaments. The ambience of the place makes you forget the grim reality of a cold November evening in the capital city of the fastest growing economy in the world. We had booked a separate room at the second or third floor. We went around one corner after the other until we were led into a cosy little room decorated in the same style with some modern elements. For instance the pictures were framed in modern golden coloured frames depicting modern scenes. The furniture was wooden, wooden were also all the screens and panels, a window simulation was hung with a long brown cloth. The crockery on the table was equally colourful but was not for use. 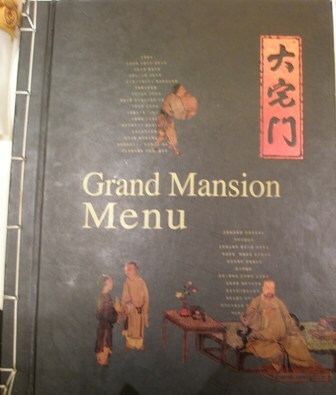 The menu consisted of a big, equally colourful book with excellent quality photos of the various dishes on offer; captions were in Chinese and English. The photos were interspersed with explanatory texts and pictures of various motives, reproductions of old material on ingredients and the history of the dishes. 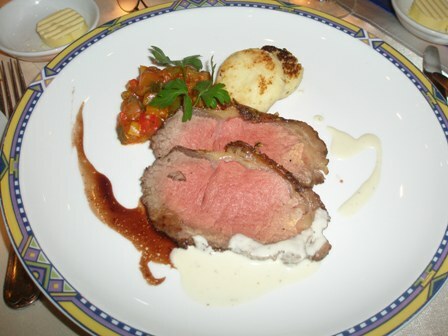 The mansion offers “aristocratic” cuisine whatever that might mean, in contrast to royal or simple peoples cuisine. 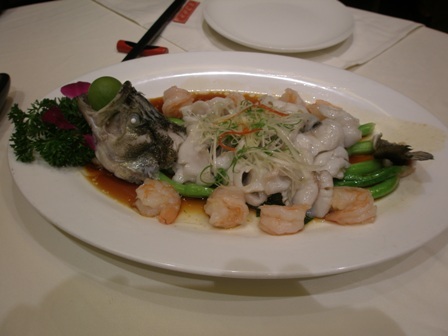 Instead of a regional denomination, the mansion praises itself for creating “modern Chinese fusion” dishes which attempt to blend various traditional and modern influences into new harmonies. To say it from the outset, the food was excellent. For my wine drinking friends, the fact that we did not have wine with our meal might come as a disappointment. So I have no clue what the wine list looks like. Instead, we drank some of the finest tea China has to offer, a dark coloured tea from Hangzhou called ‘West Lake Dragon Well tea’. The event did not lend itself to picture taking. I dared to take only a few but in order to not create too much disturbances I quickly put away the camera. 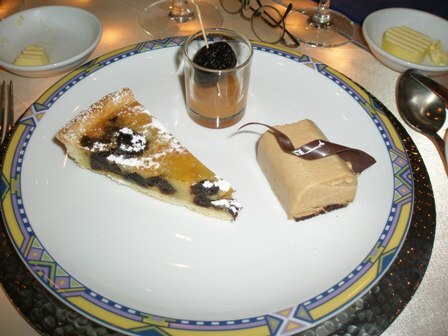 But rest assured the food was exquisite. The Mansion is a dining experience of the noble kind indeed. Today some Thai colleagues invited me for dinner and presented to me a Thai wine. What a pleasant surprise that was. We tasted a ‘2004 Kirimaya Syrah’ from Gran Monte Family Estate Vineyard. The vineyard is located in the Khao Yai region north-north-east of Bangkok in the Asoke Valley. 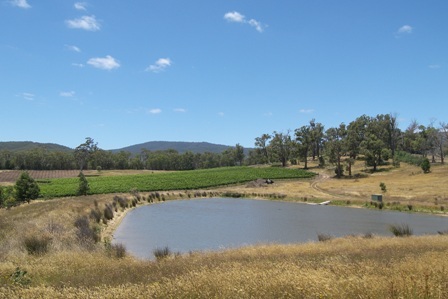 The Gran Monte Winery is set in 800 acres of beautiful land. The varieties planted are: Syrah, Tempranillo, Chenin Blanc, and Clombard. My friends told me that the vineyards are family owned and operated. About 40 acres are under vines mainly Syrah and Chenin Blanc. The ‘2004 Kirimaya Syrah’ won a gold medal somewhere ( I could not identify it because it was too dark in the restaurant). I loved this wine; it was very yummy. It showed all the characteristic of a well made Shiraz. My Thai friends promised to bring me some more bottles and suggested I should go and visit. The owner-winemaker supposedly worked for some years in Australia. Great prospects, I would say, and another exciting plan for 2009. The Asoke Valley and the Gran Monte Winery are waiting for me. I’ll keep you posted. Isn’t it amazing, that tropical countries such as Indonesia (on Bali, for instance Hatten Wines) and Thailand are also producing grapes and grape wines? Especially Thailand has a nascent wine industry of reasonable size, well protected from too much international competition by high import duties. Does that work, was my question. As a passionate free trader, I doubted it from the outset. 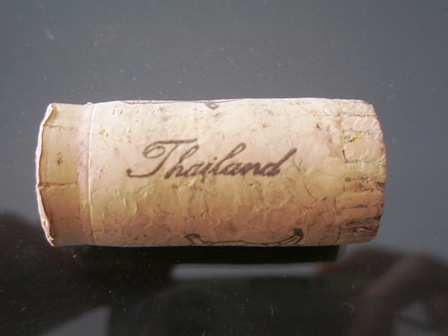 Recently, I tasted my first Thai wines. While travelling in the Khao Yai area, I acquired a bottle of ‘2003 Khao Yai Reserve Shiraz’ in a small local shop. 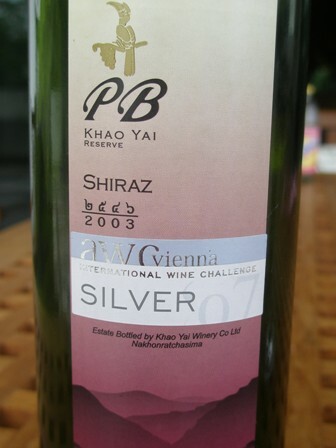 The sticker on the front label announces the award of a silver medal by the International Wine Challenge of AWC in Vienna which sounded very impressive. The Khao Yai winery is located in the PB valley of the cooler highlands about a two hours drive north of Bangkok. I was really excited while taking the bottle home and looking forward to the tasting experience. The price of 590 Thai Bath was not exactly cheap (13 EURO or 16.5 US$). The tasting, however, was very disappointing. The wine had a beautiful colour and even some “nose” (spicy), but that was is. It was a rather “thin” reddish liquid. The bottle must have gone off, that’s my hope. The judges in Vienna would not have awarded the silver medal if the wine was no good. Unfortunately, this bottle was. 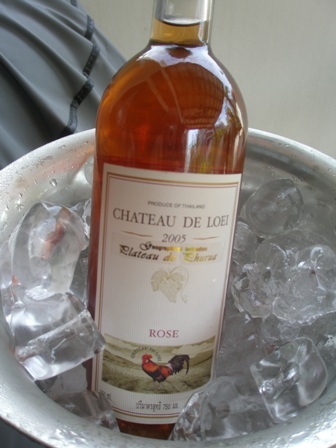 The second wine, I have tasted is a ‘2005 Chateau de Loei Rose’. I liked the label with the colourful rooster. Chateau de Loei has some retail outlets in Bangkok. I bought it in our local super market (the Villa Market in Thonglor). It was also in the 500 Bath price range. There were more expensive wines from the same company at offer but I hesitated to buy the 1,300 Bath bottle. That turned out to be a big error. Again I was heading for disappointment. This rose wine was an awful industrial liquid. Not worth mentioning anything about it. I though it would suit the food and the situation of my barbecue (on my weber) on our wonderful terrace. Well, what’s the conclusion my old mate? 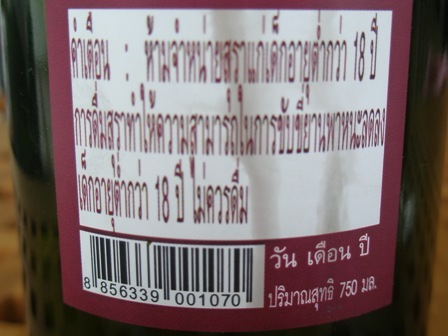 I guess I have to try some more Thai wines. Next time starting at the top price end, even if it hurts my purse, might please my palate more than my first approach. Travelling alone often makes me homesick, longing for Australia. Not any Australia of course, to be precise, my Australia, my rural Australia in Glenburn and its surroundings. In case it happens. I usually listen to the songs of one of my favourite Australian bands: The Waifs. They are not from Victoria but Perth, WA, but the feelings are very similar. “Sun, dirt, water” was just the right song today. Life is so beautiful. PS: No exceptional wine tasted as yet in Germany due to a lack of opportunity and too much work! You are currently browsing the The Man from Mosel River blog archives for December, 2008.